An energizing Summer Iced Tea, with this Iced Apple blend you firstly get the acidity from the crisp apple balanced with the sweetness from the tropical fruits finished with the punch of Mate and Lemongrass! This exciting blend of fruits, Mate Tea & Lemongrass is designed specifically to make up either as a Cold Brew or an Iced Tea in one of our fab Iced Tea Jugs and stuck in the fridge and enjoyed cold throughout the day! Try a twist on your usual cuppa this Summer, these iced tea blends will keep you cool all season, we've also got a few tea cocktail recipes over on the blog you might want to try too! (Drink Tea Responsibly!!) Loose Leaf Cold Brew Place 8g tea leaf into the Suki teapot strainer, fill up with cold water as you would do with hot water, making sure the tea leaves are soaked in water. Refrigerate overnight, add to your serving glass full of ice and Enjoy! 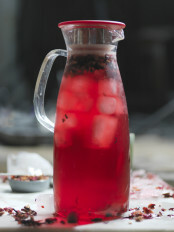 Loose Leaf Iced Tea For one Jug of Iced Tea - add 8g of loose leaf tea to the jug, gently pour 1 cup of hot water first onto the tea leaves, next add 3 cups of cold water, place in the fridge and let it brew, usually for 2 - 6 hours dependent on desired strength. Pour tea over ice cubes and Enjoy! Product : Delicious and easy to use.. Friends love it too. 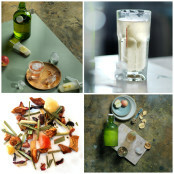 The best herbal infusions I’ve found anywhere in the world and fast delivery internationally too. First Class Service every time. I live in NE Florida, I order on Monday morning EST = the afternoon GMT. My tea arrives on Thursday - of the same week! Staff are always charming & very helpful on the phone. I now send Tea presents all over Europe & the USA & everyone loves it. They use DHL so... First Class Service every time. I live in NE Florida, I order on Monday morning EST = the afternoon GMT. My tea arrives on Thursday - of the same week! Staff are always charming & very helpful on the phone. I now send Tea presents all over Europe & the USA & everyone loves it. They use DHL so the package has to be signed for, not a bad thing in this day & age. The tea is wonderful all across the flavours & varieties. Teapots & mini milk bottles have all arrived in one piece. I gave a lot of tea as presents at Christmas & I am now reordering more as birthday presents. Can't say better than that. A very satisfied customer.